My brother is two and a half years younger than I am, and it's his birthday today. When he was tiny, our mother was inspired to try parental multitasking: she was nursing him while reading a book to me, when all of sudden he let out a holler. I had calmly reached over and chomped down on his foot. Damn it, read to me and stop that nonsense with the baby! This is a picture of him when he was about nine. 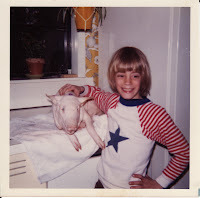 Is it any surprise that he's grown up to be an omnivore with a distinct predilection for pork? Aww; cute photo and H.B. to him. And to you and niobe, lucky ducks. I always wanted a little brother. Instead I had a big brother who treated me like his personal punching bag. Some of the time. To be fair. Happy birthday! Is that a LIVE pig on the kitchen counter?! lol! that's adorable. but where on earth did that pig come from?! was it a pet? Hope your brother's birthday was happy! I'm a little sad about the pig -- I was hoping it was an odd pet or something.